Judge Logan did it again! editorial by Wesley Fager, (c) March 6, 2004. In the past few days we have received two anonymous FAXes that have to do with the ethics of Florida's Pasco-Pinellas County, Sixth Circuit Court Judge Walt Logan. Judge Logan is the man who issued a gag order "without notice" on Ray Bradbury concerning Ambassador Mel Sembler's former medical device that Bradbury had placed for auction on e-Bay. Nine months before, this same judge made national news by issuing another "Temporary Injunction Without Notice" on a man named Manny Gonzales for Gonzales' reporting on alleged problems with Saint Petersburg, Florida furniture giant Kane's Furniture. The attorney representing both Mel Sembler and Kane's Furniture is Leonard Englander of Englander and Fischer, Saint Petersburg, Fl. How could a judge be swayed by one attorney to silence opponents of his clients without letting those opponents know that there was going to be a hearing? New evidence has surfaced showing possible fraternization between Judge Logan and the parties for whom he issues these unusual gag orders "without notice," and that is what the FAXES are about. The Faxes are letters of complaint which have been lodged with the Judicial Qualifications Commission in Tallahassee, Florida. Ray Bradbury, second from left, was among 20 people who picketed Mel Sembler's home in 2002 for Sembler's involvement in Straight. Bradbury had been shanghaied into Straight when he was a teenager. He says that he was traumatized at Straight which inflicted him and tens of thousands of other teenagers with intentional emotional distress. Eventually, he says, he succumbed to their brainwashing and became a counselor for Straight. One day, he says, it dawned on him that he was part of a business that was abusing kids. He tried to change Straight from within. When that did not work he successfully closed them under the name Straight. 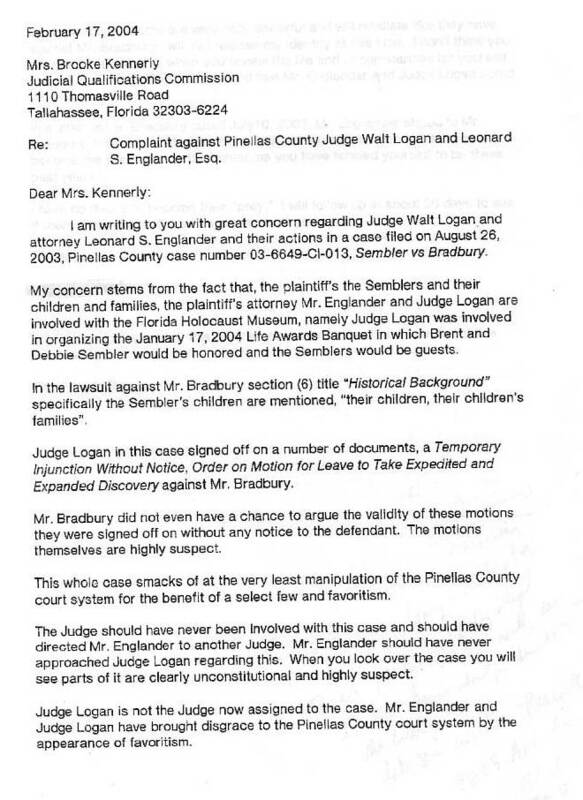 Leonard Englander has been able to prevail upon Pasco-Pinellas Sixth Circuit Judge Walt Logan that the judge should sign a "Temporary Injunction Without Notice" to silence Bradbury from speaking out against Sembler, including prohibiting Bradbury from protesting at Sembler's house along with other protesters. The "Without Notice" clause means that Englander and the judge met in private without notifying Bradbury that they were deciding his fate. Judge Logan is not the trial judge in this case, just a judge Englander went to get a gag order. But what had Ray Bradbury done that the judge felt compelled to forgo Mr. Bradbury's Constitutional right to defend himself. Look at the judge's behavior with Englander and the Kane's Furniture matter. The Florida States Attorney General's office is suing Irwin M. Novack and his Kane's Furniture company alleging, "Unfair and deceptive trade practices: scheme to defraud, civil theft, common law cheating, selling used goods as new, advertising misrepresentations and finance and warranty violations." The Better Business Bureau has reported on Kane's business practices. And so has Manny Gonzalez, a private citizen who use to run a web page warning people about Kane's furniture. Nine months before Englander got a gag "Without Notice" on Ray Bradbury, Englander walked in on Judge Logan and got him to sign a gag "Without Notice" on Manny Gonzalez. The complaint wasn't that Gonzalez was warning people about alleged problems with Kane's furniture. The charge was trademark infringement in that Mr. Gonzalez used the word "Kane" in his web page name. That's fine if Englander wants to use the trademark card, though the charge possibly could have been beat, but why a secret hearing without bothering to tell Mr. Gonzalez that an attorney and a judge were determining his fate. After all, doesn't the Constitution of the United States apply in Florida? The national media wasn't fooled. Even USA Today did a piece on the Florida judge who silenced a citizen for speaking out against what he perceived to be shoddy business practices. When his associates threw a going away party for Mel Sembler upon his purchase of the Ambassadorship to Italy, Leonard Englander and Irwin Novack were there. Leonard Englander is on the board of directors of the Florida Holocaust Museum. The museum was founded by Straight Foundation president Walter Loebenberg. Mel and Betty Sembler have been on its board along with former Straight board member Jay Synder. Former Straight board member Dr. Bruce Epstein is the past director of the Florida Holocaust Museum. Kane's Furniture sponsors an exhibit at the museum. In 1999 the museum held its first annual "To Life" banquet. The furniture for the event was loaned by Kane's Furniture. Last month the Florida Holocaust Museum hosted its 2004 annual "To Life" ceremony. Mel Sembler's son Brent and his wife were awarded one of the two "To Life" awards for, among other things, their fight against racism even though one Sembler venue is being protested weekly by a segment of the black commuity for alleged racism. The celebration was picketed by the Straight awareness crowd who want the hypocrisy of the infiltration of the Florida Holocaust Museum by former Straight officers exposed. The Dinner Committee. The Diner Committee for the Holocaust "To Life" Awards banquet included, among others, Mel and Betty Sembler's son Greg and his wife Elizabeth; former Straight board member and former acting director of the Florida Holocaust Museum Dr. Bruce Epstein and his wife Amy (Past President of the Florida Holocaust Museum); Craig Sher (CEO of Sembler Company) and his wife Jan (who is on the board of trustees for the museum); board trustee member Jim Soble who is legal council for Sembler Company and his wife Ann; Herb Goldstein and wife Alene (a Herb Goldstein was a founding director of Straight); Irwin Novack of Kane's Furniture and his wife Patty; and Judge Walt Logan and his wife Lin. Judge Logan got to meet and socialize with the Semblers, the Loebenbergs, the Englanders and the Novacks. He heard firsthand as the gossip must have spread around the room about protesters having the gall to protest an event associated with the dastardly extermination of European Jewry. Really, who could find fault in such a somber occasion. Melvin Sembler is such a master coalition builder. Read how he orchestrated seating arrangements for the mother of all toga parties so that if the ambassadors from foreign countries asked about Straight there would always be someone from Straight to set them straight. He had Judge Logan set up the same way. Now Judge Logan has prejudiced himself irrevocably against Ray Bradbury. This is just the latest episode in judicial malfeasance for Judge Logan. There are other problems. Later as he was facing a reprimand from the Florida State Supreme Court, Judge Cope sued the women for malicious prosecution. A 2003 study by the the Saint Petersburg Times revealed that since returning to work last August after a one-year paid leave of absence, Cope's work calendar showed no work scheduled either in his office or the courtroom for 51 days. Notwithstanding, then Pinellas-Pasco Chief Judge Susan Schaeffer stated that "He has one of the best work ethics of all our circuit judges." In 2002 the former chief judge of the Pinellas-Pasco Circuit Court and a retired appelate judge, David Patterson, was found in his Treasure Island home by his estranged wife, dead of a self inflicted gunshot wound. His wife had gotten a court order to keep him away after he had threatened her. He had been hospitalized under the Baker Act. He had been arrested for a DUI. State Rep. Jeffrey Kottkamp, chairman of the House Judiciary Committee, had instructed his staff to start putting together investigative material in preparation for presenting an impeachment hearing on Judge Cope. In 1996 Judge Cope was arrested for a DUI but that charge was dropped. The state had been forced to deal with Judge Cope after the November 2003 issue of the Reader's Digest, an internationally read magazine, gave one of three of its annual Broken Gavel awards for the worst judges in America to Judge Charles W. Cope. The headline for the Broken Gavel Award was "Sleazy, corrupt or abusive." In 2000 the Digest named Hernando County Judge Peyton Hyslop to the worst judge list. When attorney Walt Logan ran for his judgeship he was by far his own biggest financial contributor. But next to his own contribution was the $500 limit from Walter Loebenberg. His third highest contributors gave matching amounts. They were Ted Wittner and US Enterprises. But US Enterprises is owned by Walter Loebenberg and Walter Loebenberg is on the board of directors of Colony Savings Bank which is owned by Ted Wittner! [A Sharyn Wittner is on the board of trustees for the Holocaust Museum and Sharyn and Ted Wittner have been listed together in the local newspaper.] Look at Operation PAR. Judge Logan has stated publicly, "There isn't a day that goes by that we [the courts] don't send someone to Operation PAR at some level." The Sixth Circuit used to send kids to Straight as an alternative to jail; now it sends them to Operation PAR. But Straight cofounder Betty Sembler is on the board of directors of Operation PAR. Judge Logan is just another Sixth Circuit judge who has allowed himself to become unduly influenced by the Semblers. The story of the influence of Straight and Mel Sembler upon Florida courts is here. The complete story of Judge Logan's association with Sembler is found here and here. We had hoped the matter would go unreported for now because the only way Ray Bradbury is going to lose his legal battle with Mel Sembler is that the judge has already been instructed on the verdict to issue or on which way to influence the jury should there be a jury trial. [See Bradbury set up by Sixth Circuit, Round 1]. Should that happen this case needs ultimately to be appealed to federal court outside of Florida. We were waiting for that possible outcome. But an anonymous writer has already notified the ethics committee for the Florida bar. Understandably the writer has chosen to remain anonymous declaring not wanting to become the prey of Lenny Englander as Englander has stated he will make Ray Bradbury. To use the words of Leonard Englander, Judge Logan's actions have "exceeded all sensibilities." We are so upset about Judge Logan allowing himself to be manipulated by the Straight crowd that there will be another letter to the Judicial Qualifications Commission in Tallahassee, Florida. That letter will not be anonymous. It will be coming from Wesley Fager. The obvious reason for publishing this report now is because the cat is already out of the bag. But there is another reason. We want to warn Mrs. Brooke Kennerly of the Judicial Qualifications Commission in Tallahassee before she finds herself at a dinner at the governor's mansion seated with the Governor of Florida and Straight (now called Drug Free America Foundation) Advisory Board member Jeb Bush, his wife Columba (another Straight Advisory Board member), Lieutenant Governor Toni Jennings (another Straight Advisory Board member) and four prominent businessmen--all former Straight board members--incognito. You got blacks asking for the resignation of Darryl Rouson from the NAACP. You got the Saint Petersburg Times losing the respect it had once enjoyed for standing up to another major cult, the "so called" Church of Scientology. You got Stephanie Haynes of the Drug Prevention Network of the Americas being grilled for associating with Straight. You got MSNBC asking Jeb Bush (who joined Straight's Advisory Board after Betty Sembler served as his campaign finance cochair) why he did not send Noelle to SAFE (formerly Straight-Orlando) since he endorses the program. [Speaking of SAFE, watch this video on SAFE and you might understand better why many people, including Ray Bradbury, picket SAFE and some other second-generation Straights as well as Mel Sembler's house.] You even got Jeb's daddy and the Republican Party being drilled for Bush's TV commercial for Straight in return for $126,000. And now you got a judge who is making a laughing stock of his circuit. You see Judge Logan, there is a heavy price to be paid when you put your hands in Mel Sembler's pockets. Two things in life are abundantly clear. The sun rose to the east of Washington, DC this morning and before the sun reaches its zenith this afternoon, Mel Sembler will have called Jeb Bush over the JQC letter. Does Sembler have to remind the governor that by joining Straight's Advisory Board he is now inexorably tied to the outcome of the Bradbury case. If the horrors of Straight resurface Jeb Bush's name will forever be tied to criminal child abuse. We predict that the governor's office will call Ms. Kennerly by 0900 EST Monday for this is how things are done in the Sunshine State. Anybody know the address for the Readers Digest?